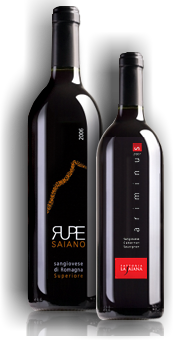 The Fattoria Saiana, named after the picturesque Saiano cliff that faces towards one side of the estate, is located in the hills where the towers of San Marino and the Rocca di Verucchio majestically guard the surrounding landscape. It is situated near to the splendid towns of Torriana and Montebello, alongside the river Marecchia at a point where the region of Romagna rolls into Tuscany and the Marches. To obtain a prestigious wine the conditions must be perfect: from the texture of the slightly stony soil, to the careful selection of the grapes, the care with which they are cultivated and picked and the yield of the grape harvest. Grand wine tasting evening in Romagna.